It was tempting fate. Only two days after the most enormous storm, to go up into the mountains, to the rainiest place in Spain. It was twenty-three degrees when we set out from Jerez that morning. The sky was blue with high clouds and the usual breeze and it stayed that way as we drove, with fingers crossed, to Arcos de la Frontera. 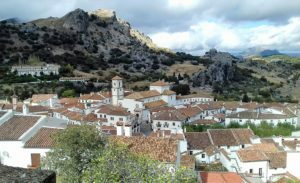 Arcos is worthy of greater consideration than I can give in this article and I will write about it in future, its upper town on the escarpment and the lower town around the lake. It is one of the first of the pueblos blancos of Andalucia – the white villages – that one encounters when travelling east from the Atlantic coast, though it is more of a town than a village. 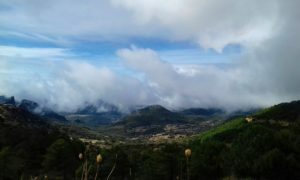 We do not stop but press on for El Bosque – The Wood – a pueblo blanco at the edge of the Sierra de Grazalema National Park. First there are rolling hills and fields not so different from the topography of downland southern England, but, gradually, the hills get higher and are no longer cultivated, but tree-covered, with grey outcrops of rock. Dark, heavy clouds, blue to black, sit on the horizon, cloaking the mountains. Through El Bosque and we are in mountain country, turning off the main highway to Ubrique, which skirts around the south of the high peaks of the Park, on to the mountain road. A narrow, twisting affair, with ever climbing switch-backs along the slopes, its sides are lined, above the precipices, with heavy blocks of stone or concrete. Shafts of sunlight through the low cloud blanket revealed jewelled colours – the luminous green peculiar to the pinsapar – Abies pinsapo, the Spanish fir – its tall slim damp trunks almost black above ruddy earth and the startling white of fallen rocks. Car windows lowered we breathe in the distinctive resinous scent of the pine woods. Higher and higher, above valleys and rushing stream to Benamahoma, perching on the slopes where the Rio del Bosque rises beneath the Labradillo. No time to stop. It hadn’t rained yet, so press on for Grazalema. We drive along the southern side of the Pinar range. Our ears begin to block and pop, a sign we’re at altitude. To our left the clouds shroud mighty Torreon and the crest which stretches across to the summit of San Cristobal, never less than 1,500m high ( c.5,000ft )². Opposite, across a deep valley with little peaks of its own, is the Salto de Cabrero gorge and, beyond, the white, jagged peaks of the El Endrinal range. 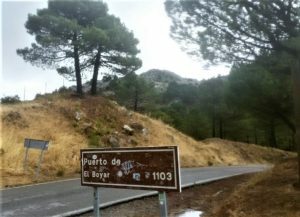 We stop at El Puerto de Boyar, the pass at 1103m ( 3,618ft ) to look back down the Corredor de Boyar, (see photo above) that narrowing channel which funnels the weather from the coast to the mountains and means that Grazalema has the highest rainfall in Spain. Time for the sweaters and the windcheaters. The temperature is now in single figures and the dogs shiver in the cold (when they are still, which isn’t often ). Onwards and upwards. Higher up and farther in.¹. We’re in one of the ‘hanging valleys’, those very high vales and flats which lie closer to the summits. Then we round a corner and find ourselves facing white air, the ground is far below. The road swerves and clings to the rocky mountain side, descending to our destination, Grazalema, nestling in the bowl of land beneath the Penons Grande, de la Asambles and Gordo. And it’s not even raining. 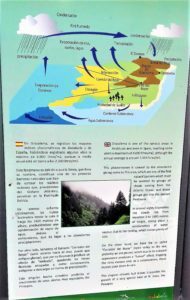 There will be more articles about the Sierra de Grazalema and its pueblos, flora and fauna and some of the Senderos – the walks and hikes around the mountains. ¹The rallying cry at the end of the final Narnia story The Last Battle as the heroes climb to the summit of heaven. ²Ben Nevis, the highest mountain in the UK, is 1,345m or 4,411 feet high. Monte Baldo in the Italian Alps stands at 2,218m and Canigou in the Pyrenees at 2,780m ( both mountains of my acquaintance ). Mont Blanc is at 4,808m. This entry was posted in From a Foreign Field, Nature Watch and tagged Foreign field, Nature, Worth a visit by juliej. Bookmark the permalink.